.... or Mike and I form a puzzling tag team! I hope you all had a very Merry Christmas and that the coming New Year is a happy healthy one full of friends, family and, of course, puzzles! So today we will look at a few new disentanglements. As you know, disentanglements are one of the classic (and quite possibly oldest) puzzle types. All bloggers review them, but I think my esteemed editor/publisher Kevin Sadler has provided his readership with a particularly compendious record of currently available (and sometimes quite unavailable) disentanglements. This has been very helpful to me, especially recently. Since early summer I’ve found myself increasingly drawn into the disentanglement world. This stems from equal parts financial miserliness and intellectual curiosity. 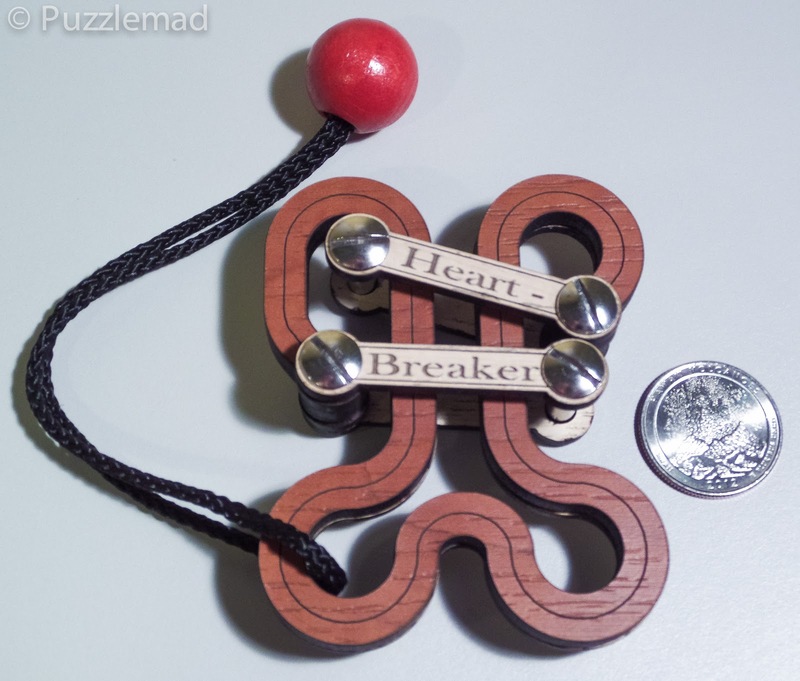 As is often observed, this type of puzzle gives enormous bang for the buck. It really is true. Few puzzles will cause you more anguish or greater self-satisfaction than a really challenging wire or string disentanglement. To carry over a theme from my last installment, I think this may have a lot to do with expectations - hand me a burr and I will immediately know that I am about to be challenged (not my strong suit). But hand me a wire or string and my attitude is usually a smug “well, this shouldn’t take long.” But invariably it does take long. Sometimes VERY long. Initial enthusiasm eventually turns into frustration, followed by the realization that I am not nearly as bright as I thought and possibly a complete fraud (Ed - I have those thoughts all the time! I KNOW I'm not very bright!) Eventually panic sets in and then all bets are off. Worst case, it gets tossed on the unsolved pile of shame. My only comfort is that I am not alone in this. I’m guessing the experience is common to most puzzlers (Ed - Yep). With disentanglements, you just have to stick it out and work through the pain. If you don’t give up, I promise that you will solve any and every disentanglement you attempt...... eventually. And the payoff is big, at least for me. I get a kind of satisfaction from solving these that I don’t get with most other puzzles. Good disentanglements exploit fundamental blind spots in the brain. Every time I solve one, I feel that I have one less blind spot and that has to be a good thing. Alright, enough pep talk. How about a puzzle? 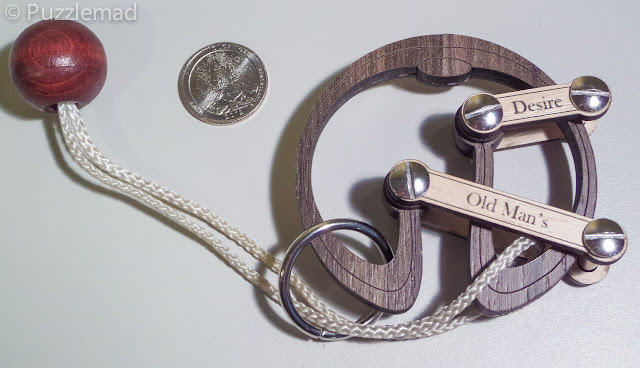 Today I present three fairly new string disentanglements offered by Siebenstein-Spiele. They bear the foreboding names Misery, Heart Breaker, and (more cheekily) Old Man’s Desire. 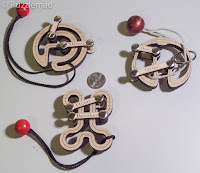 All three are made of laser cut wood, nickel-plated (I assume) steel pins and a ball and string. Old Man’s Desire is a little different in that it has finer, more elegant lines and also sports a ring. 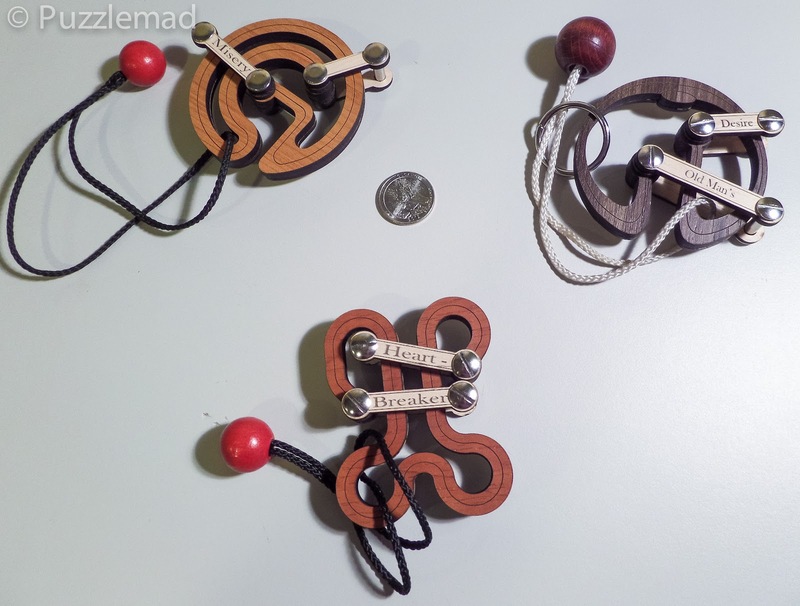 The puzzles are each made from two identically-shaped pieces glued together. They each have a darker colored wood on one side and a lighter finish on the reverse. I think the ‘front’ side is particularly attractive. The unique feature of these puzzles, and what originally attracted my attention when shopping, are the swing arms. 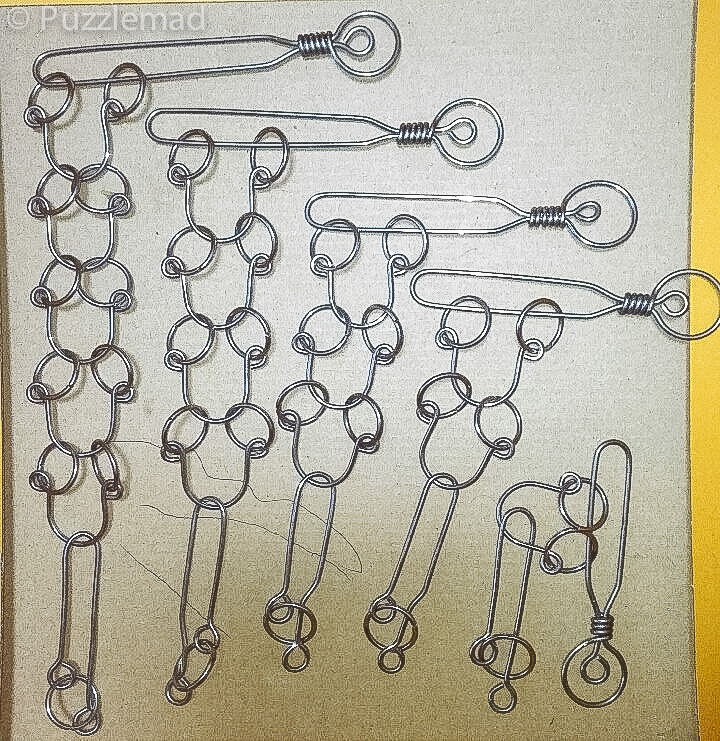 Each has two ‘arms’ attached to the body of the puzzle with characteristic Siebenstein-Spiele pins. Very intriguing. I haven’t seen this before and I suspect it may be a true innovation by Siebenstein-Spiele. Please feel free to disabuse me of this notion if you know otherwise! I am really curious about any possible predecessors, even things conceptually similar. But they do not look like any other disentanglement I have dealt with to date. Aesthetically, I think all would agree that these are fantastic looking puzzles. The use of laser cut wood in this manner is, to me at least, a real breath of fresh air. These puzzles don’t jingle and jangle (Ed - this means that I might be safe in my own living room!) and they are much more pleasant to handle and manipulate than the chunky wood and string entanglements. The designs are well-proportioned and visually interesting. The swing arms are fun to manipulate and give the puzzles a somewhat dynamic element. As you can tell, I really like these puzzles. They stand apart from all the other entanglements available today, and in a very good way. As far as the puzzling aspect, you might guess from the structure that the solution involves a known movement. And you would be right. But because of the unusual swing arm element, the solution is sufficiently distinct to be considered an original variation (whatever that means). 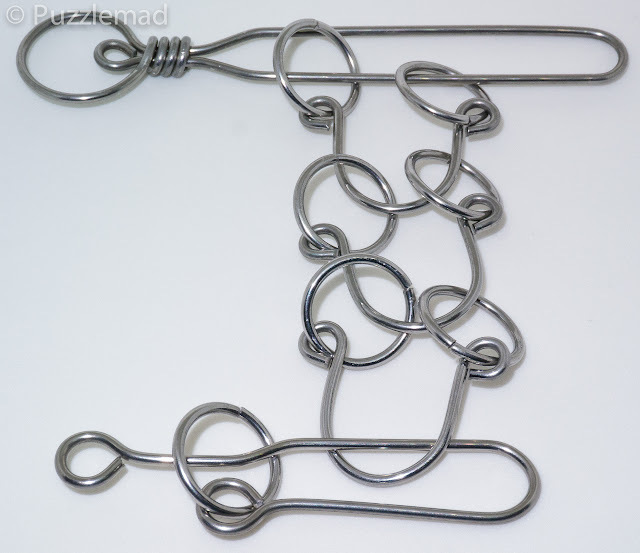 Experienced puzzlers will see in the swing arms an underlying similarity to puzzles like tripwire. But I think you will still have to work at it to apply your knowledge. If you have not dealt with this class of entanglement before, all the better. You are in for a treat! Which brings us to difficulty factor. Puzzlemaster have rated all three as Level 8 (Demanding) on their inexplicable 5-10 rating scale. This is pretty accurate, based on my experience. Unless you are one of those few naturally gifted disentanglers, this puzzle will present you with a reasonable level of challenge. That said, it is not horrendous either. You will get this one with some effort, and I should stress that despite the string, it is not really susceptible to getting tangled into a mess. I know that will be a central concern for even the most experienced puzzlers. But fear not. Even if you tend to shy away from string puzzles, I highly recommend you give one of the three a shot. The architecture is fairly simple and in most cases you can easily backtrack, or else your attempts return you to the start position. It is possible to make ‘advancements’ that don’t advance you, but that’s all part of the fun and certainly better than making knots. These puzzles have what I think of as a downhill initial solution. That is to say, the string ‘wants’ to come off, you just need to help it along (Ed - now that's an interesting idea!). Putting the string back in position, however, is an uphill battle. Like many disentanglements, you will probably get the string off without carefully observing a process. But you won’t be able to reattach it so casually. It will require deliberate effort. And it will require you to truly ‘solve’ the puzzle. I found this to be thoroughly enjoyable. The puzzles took me to the point of worry and self-doubt but no further. The solve time is measured in minutes and hours, not days. Right in the sweet spot. 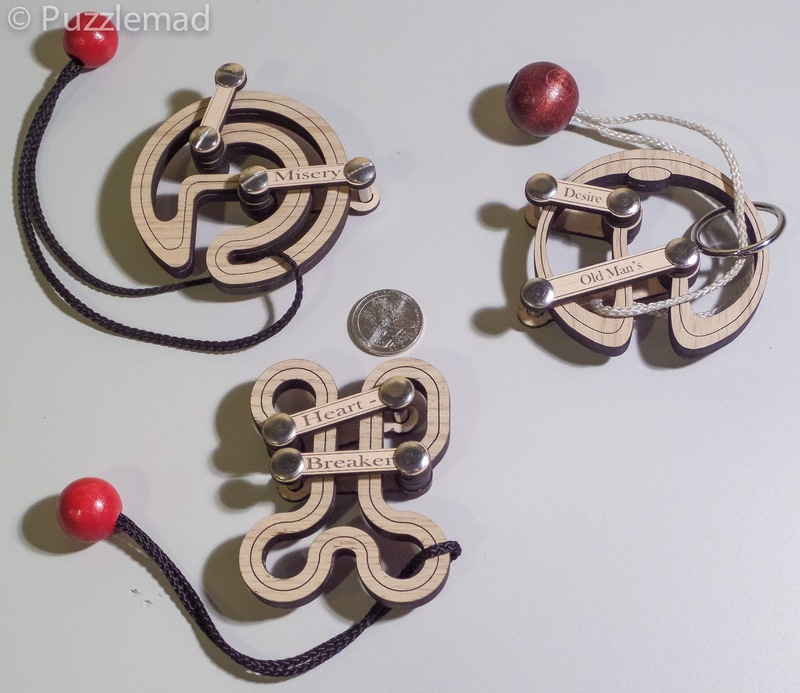 As you can probably tell from the pictures, these puzzles all share similar design elements and it is natural to be concerned whether the individual solutions are sufficiently unique. That’s a tough one without giving anything away. I can say that the solutions are quite similar in some major respects, so after you solve the first one, the others should go quicker. That said, solving one does not make any of the others easy. Because of the variation in the designs, each one has to be thought through on its own, even though you know the principal involved. I don’t think you will be wasting money if you buy all three. But of course, you don’t really need to buy all three. Your maximum a-ha will probably be from the first one you solve, and diminish thereafter. I personally found each one to be enjoyable and worthwhile. And it’s kind of nice to have the set. Certainly Misery and Heart Breaker make a nice pair. These are among the few disentanglements that display well, in my opinion (Ed - have a look at the tavern puzzles then!). My only gripe is that Siebenstein-Spiele saw fit to give Old Man’s Desire a white string. Really white. My hands are not particularly dirty (despite my profession) but I immediately soiled the string and now it looks really grimy. Also, you will notice that Old Man’s Desire has a ring. This turns out to be more of an annoyance than anything else and was certainly unnecessary to the puzzle. That is not a spoiler. It is completely trivial to maneuver the ring to the ball, at which point it serves no purpose. In fact, the ring can only go to the ball and nowhere else. If it served any purpose, such as to confuse or mislead, I would not mention it and let you figure it out. As it stands, I assume the ring was added to further distinguish the puzzle from Misery, possibly as an afterthought. The Puzzlemaster description says that the goal is to remove the ring. But obviously the puzzle is to remove the string (Ed - are you really sure about that? Can't the ring come off?) Rings get needlessly appended to otherwise fine sting puzzles a lot, it seems. But don’t be dissuaded by this, Old Man’s Misery is a good puzzle and I especially congratulate the designer on the graceful lines. There is one other puzzle in this line which I haven’t tried, Drunter and Drüber. I haven’t purchased it yet because I am rarely in the mood for a ‘chinese rings’ type puzzle, of which this looks to be. I am pretty confident that it uses the same transformation as the other three (probably many times over), so I am not sure there will be much of an a-ha for me at this point. But who am I kidding. I will end up getting it eventually and I’ll let you know with an update when I do. Ed - it looks fab to me! All three of these puzzles are available at Puzzlemaster, as expected. Misery and Heart Breaker are also at Brilliant Puzzles, offered with a little better shipping rate if you are in the US. Hendrik sells them for folks in the old country (Ed - who are you calling old?). Price is in the $15 US dollar range, which I think is a great deal. These puzzles are well designed, well made, and fun to solve. You can’t go wrong getting any or all of them. Hope the year-end review is coming along nicely. Looking forward to it. Ed - I'm getting there - it is VERY tough to choose the best of the year! So now it is back to me to continue the disentanglement tag team! Here is a puzzle that none of you will have played with before but hopefully one of the puzzle producers will see this and decide to contact the designer to have it mass produced! May I present to you the Chinese Lantern puzzle designed and produced for me by Wang Yulong. 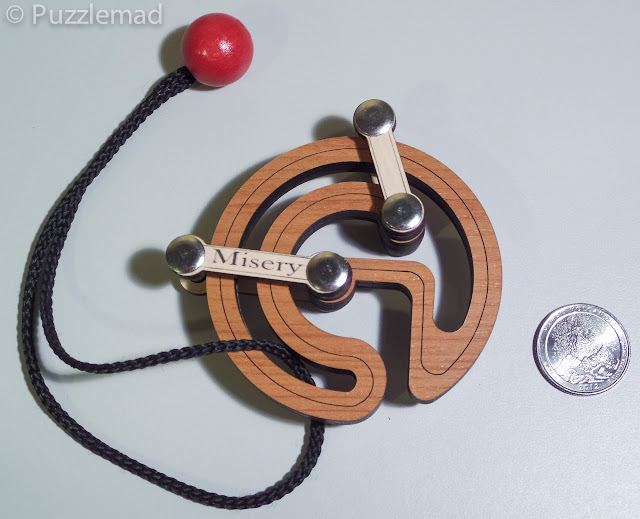 I obtained this puzzle quite some time ago along with a whole load of variants on the ball and chain puzzles which I ruefully reviewed here along with an admission of terrible guilt! It was the last one that I attempted from that group and I initially thought that it would be quite trivial. 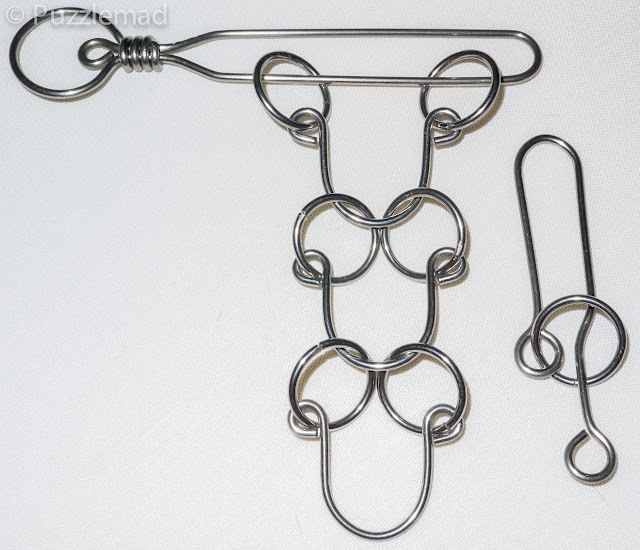 It bore a remarkable resemblance to a classic puzzle - like the Dirty Dog here and other similar designs. The difference, however, is that there is no bar at the top of the puzzle - the exit feature is actually part of the shuttle which makes it MUCH more complex. I made the first few moves pretty easily, I thought and found that there are variations in the moves which can make life rather difficult and have pieces oriented the wrong way around for further moves. After 3 moves the difference from the classic puzzle suddenly revealed itself to me and I got completely stuck. I kept going back and forth in Einstein's definition of insanity but nothing ever changed and so I put it in my work bag and when I had a few minutes I would take it out and play. I even let a few colleagues have a try but apart from the urge to bend it, no one got anywhere. This puzzle is hand-made and the wire is a much narrower gauge than the puzzles from Puzzle Master or Livewire Puzzles. This unfortunately means that it is possible to bend it if too much force is used. Remember that with these the only real power required is brain power NOT muscle! I am still carrying it with me wherever I go because it is just so much fun to play with. I have realised that there is very little chance that anyone else will solve it but I do enjoy showing it off. I have mentioned to my friend (and through him to Wang Yulong) that this would be even more fun with more horseshoe components to make it more complex. I am aware that Wang Yulong has very recently undergone major surgery and required a very long recuperation so I was very surprised and extremely pleased to see that he agreed with my idea and has already worked to make it happen - he posted this picture recently of a whole family of Lanterns. I hope that one of the major producers finds a way to release this to the world in general along with other designs of his - he is truly brilliant! My "Best Puzzles of the Year" post is well in hand - I have more or less decided what goes in - just working on writing it now! Come back on New Year's Day to see whether you agree with me. Wang Yulong published Chinese Lantern on March 9 2015. I asked him who is the designer of the puzzle and the answer is Wu Jianjiang, a friend of Wang. Wang published mainly designs of Wu Jioanjiang. I want to note also that the simplest version of the series is equivalent to the puzzle "Wippe" from Puzzle Masters, designed by Jean Claude Constantine. This is just to know the history of this nice puzzle. Thank you for the extra information - it all helps. UPDATE: Just recently came across this: http://www.puzzle-factory.com/roundabout.html which is obviously very similar to Misery. I think Round About as been at Puzzle Factory for at least as long as Misery has been around. And their designs are not usually original. So likely other antecedents as well. That's what you get for trusting a newb for your puzzle info! That's a new site for me - Thanks for that! A lot of their stuff does look familiar. They seem to have a good selection but an odd ordering method that's not suited to international ordering.